Ready-mixed concrete is the main business of RMC Arriance (A Division of AIPL).Looking at the rapidly developing industries, the scenario indicates and futuristic demands of infrastructure in Indian market. The need for a well built offices as well as the residence,will be at boom soon, Arriance RMC is thus a smart effort to contribute the quality rich concrete in a readymade format to meet the present jazzy demands as well as preparing for long run too. Arriance RMC is well equipped with the quality lab and advanced machinery to match the pace of growth and make its contribution qualitative in the particular field. Indore is commerical capital of MP; here potential growth is very vast. As per need of industries we launched our Arriance RMC product to deliver the promise of standardized concrete product.The rich quality concrete is delivered with the help of our advanced machinery having plant capacity of 60 cu.m/hr. The concrete is discharged at the site after proper mixing, as desired by the client. Arriance RMC is the promising name of high commitment towards quality and service. Our organization is positioned At Indore, Madhya Pradesh and has gained immense acknowledgement and a respected place in the market. We ensure that the products will remain in a safe condition and for this;we have hired experts who keep a strict vigilance on the entire unit. Moreover,our unit is timely upgraded ensuring more safety.We have developed several offline as well as online options for the convenience of clients to ensure faster trade. Ready Mix Concrete that we offer is processed using the latest techniques so as to remove all kinds of foreign substances in one go. The name of our company surfaces prominently among the trusted Manufacturers and Suppliers of Ready Mix Concrete. It is made under the strict vigilance of experts. One can place retail as well as bulk orders for Ready Mix Concrete with us. Timely delivery is our forte as we have up-to-date transit facilities and logistic services. We are among the major players in the market offering top-notch Ready Mix Concrete and that too at marginal prices. Being a quality-conscious firm,we ensure that the offered products comply with the laid industry standards and are of supreme quality. Our organization is graded among receptive and responsible Suppliers of Ready Mix Concrete,involved in providing to purchase across diverse market places. We have dedicated staffs that ensure the quality of material used for designing and production. The inspection is done on the initial stages to make the final product free from defect. Being a Supplier of Ready Mixed Concrete,we continue in the samevein and keepenchanting our customers with our spotless quality. Buyers can stay rest assured about the quality four products as we check each and every product at diverse stages. Sale of ready mixed concrete,from m-10 grade to m-60 grade. The strength of concrete is probably the most important property that must be tested to Comply with specifications.To achieve the desired strength,we carefully control the manufacturing process, which we normally do by using statistical process control. Arriance RMC has an up-to-date digitally equipped laboratory to test the concrete and aggregates etc. In precise conformity according to Standards. Mix designs are prepared by NABL Approved laboratories only and are inspected by our plant specialists before the actual production. 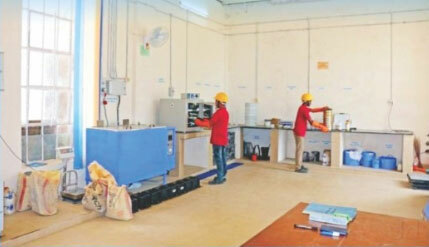 All raw materials are tested before taking entry in the plant. Quality control charts are thoroughly maintained by plant staff and by the engineer on site to continually assess the strength of concrete. Other properties important for compliance indude cement content,water/cement ratio,and workability by the standard test methods.Quality Control Laboratory is also equipped to test raw materials,monitor quality of concrete in production and to test the strength of concrete cubes taken during production and also from the point of delivery. Being a customer-centricorganization, RMC Arriance carefully looks into the exact needs of its customers,innovatively designs concretemixes and optimizes mixture proportions that satisfy not only the given technical requirements but are also cost-effective,thus benefiting the customers. Arriance RMC is keen about its promise of quality maintenance In concrete.Testing and other rigorous procedures are being strictly followed for the regular up keep of machines, equipment sand the type of input materials used in concrete. Time is money,and here RMC saves time and money both for a customer.As the mixture is already been prepared by our advance machineries,it comes in ready to use form,thus saving mixing and preparation time of concrete onsite. This is yet another benefit of using RMC,it saves you from finding a storage space for ingredients to be used and also from paying a cost to procure and maintain them at the place. RMC being awell mechanized job,is here done by our smart machines in back end,which prevents customer from spending on a larger labor force. The chance of wastage is more in Site-Mixed concrete than in RMC, which simply makes the RMC cost effective in long run.RMC process is handled by machines,thus minimizing the chances of wastage and directly accruing benefits to customers.